You are invited to attend a Town Hall Meeting on the Illinois state budget to be held from 7:00 p.m. – 8:30 p.m. on Tuesday, April 23 at the DeKalb County Community Outreach Building located at 2500 North Annie Glidden Road. I am hosting this Town Hall Meeting with Senator Dave Syverson and Representative Tom Demmer. The Town Hall Meeting will feature a presentation on the state budget followed by a question-and-answer period moderated by Eric Olson, General Manager of the Daily Chronicle. Attendees will be encouraged to submit questions on notecards that will be circulated throughout the presentation and discussion. This year’s state budget will be a turning point in Illinois’ trajectory, one way or the other. Public input at our Town Hall meeting is vital to help move the conversation forward on what the state’s budget-related priorities should be and how they impact our community. If you have questions or concerns on any issues unrelated to the state budget, please attend one of our Traveling Office Hours or call/e-mail my district at any time at (815) 748-3494 / keicher@ilhousegop.org. I spoke at a Capitol press conference in Springfield last week on Governor JB Pritzker’s graduated income tax plan and how Illinois families pay the highest overall tax burden in the country. To watch the short video of my remarks, please click HERE. Want to share your views on the Governor’s graduated income tax plan? Are you worried about how it could impact your family or small business? Please call my district office at (815) 748-3494 or email me at keicher@ilhousegop.org. Your feedback is always welcome and appreciated. Remove the statute of limitations on prosecuting sexual assault (HB 2135) – Advances in DNA testing have made it possible to solve decades-old cases with evidence that wasn’t available at the time. That’s why we took the important step to approve legislation on Thursday to remove the statute of limitations on prosecuting sexual assault offenses and thereby give law enforcement and prosecutors the ability to conduct an investigation and bring charges against a suspect without a time restriction. House Bill 2135 earned unanimous bipartisan support in a vote of 113-0. “Home Alone” bill to protect parents of young teens from being charged with child neglect, abandonment (HB 2334) – The Illinois House of Representatives overwhelmingly approved a bill Wednesday to lower the age at which children can be left home without supervision from 14 down to 12. Currently under state law, a child under the age of 14 who is left without supervision for “an unreasonable amount of time” is considered neglected; and a parent or other individual responsible for a child’s welfare can be charged with child abandonment for leaving a minor under the age of 13 without supervision by a responsible person over the age of 14 for a period of 24 hours or more. Our bill makes a common-sense adjustment to state law to recognize that single or working parents who struggle to afford child care should not live under the fear of losing their kids simply for working hard to support their family. House Bill 2334 passed by a vote of 111-1. Nationwide, current state laws that define a certain age when children may be left home alone range from age 6 in Kansas to age 14 in Illinois. While 45 states have statutes on this subject, only 14 specify a certain age, with the most common age being 10. Empower youth in DCFS facilities to have a voice in improving their own care (HB 3153) – The Illinois House of Representatives has unanimously approved bipartisan legislation to give youth living in facilities managed by the Department of Children and Family Services (DCFS) a strong and influential voice in shaping decisions to improve the care they receive. Specifically, House Bill 3153 requires DCFS to place a locked suggestion box in each group home, shelter, and transitional living arrangement that accepts youth in care for placement by DCFS. If enacted into law, DCFS would be required to issue an annual report to the General Assembly outlining the concerns submitted to the boxes and the solutions for each concern. This initiative will empower youth living in a DCFS facility to make anonymous suggestions to improve the quality and conditions of the care they receive. Current law already requires DCFS to place locked suggestion boxes in each residential treatment center. Only DCFS employees have access to these suggestion boxes, however. We should allow the youth we serve to make suggestions too. Together we can make the DCFS system more accountable and effective. House Bill 3153 now advances to the State Senate for consideration. It secured final passage in the House of Representatives by a vote of 111-0 on March 27. Middle School Art Contest Open to 70th District Students – DEADLINE APRIL 26! Middle school students who live in the 70th Representative District are invited to submit artwork to my Legislative Art Contest! An overall winner and two runners-up will be chosen to have their artwork displayed at the State Capitol in Springfield for one week during the spring legislative session. The competition is open to all middle school students. Artwork must be two-dimensional. Each framed artwork can be no larger than 30 inches high, 30 inches wide, and 4 inches deep. No framed piece should weigh more than 15 pounds. Drawings: colored pencil, pencil, ink, marker, pastels, charcoal. Mixed Media: use of more than two mediums. Each entry must be original in concept, design, and execution and may not violate U.S. copyright laws. Any entry that has been copied from an existing photo or image (including a painting, graphic, or advertisement) that was created by someone other than the student is a violation of the competition rules and will not be accepted. 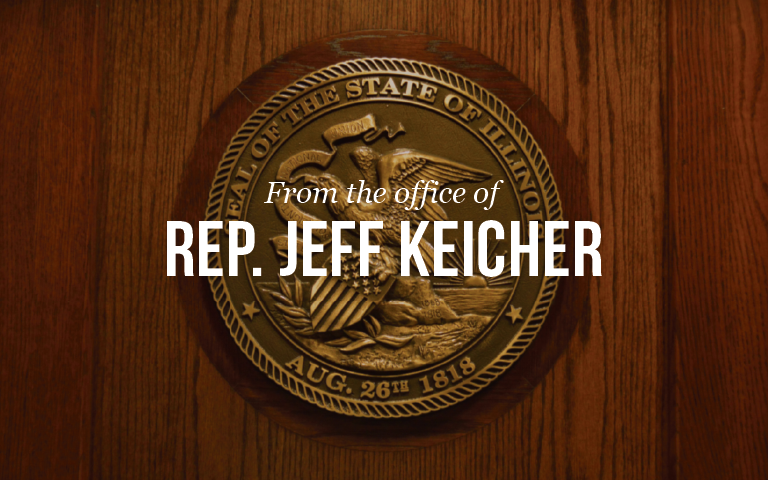 State Representative Jeff Keicher, 158 W State St, Suite C, Sycamore, IL 60178. Not sure if you live in the 70th District? Click HERE. For questions or more information, please call the district office at (815) 748-3494. The opioid crisis in Illinois and indeed across the country is tragic. Too many lives have been lost, and more remain in jeopardy unless we act. Thankfully, the State of Illinois recently launched the Opioid Alternative Pilot Program, which allows access to medical marijuana for individuals who have or could receive a prescription for opioids as certified by a physician licensed in Illinois. Data from the Illinois Department of Public Health indicates opioid deaths in Illinois increased 13 percent from 2016 to 2017. Opioids can be highly addictive in a very short period of time. This program offers qualifying individuals an alternative to manage their pain. The long-term goal of this program is to reduce opioid deaths. To learn more about the Illinois Opioid Alternative Pilot Program, please click HERE. I am pleased to support this program. I am also a co-sponsor of the bill to expand and make permanent Illinois’ medical cannabis law, House Bill 895. This will would expand the list of qualifying conditions to include osteoarthritis, autism and chronic pain, among other conditions. For a good recap of this issue and the bill I’m co-sponsoring, please read the Chicago Tribune article by clicking HERE. Have questions or concerns on state issues or legislation that you would like to share with me? While you’re always welcome to call, e-mail, or stop by my new District Office in downtown Sycamore located at 158 W. State Street, Suite C any time during the year, I recognize that it may be more convenient for you to visit a location closer to where you live. That’s why we’re excited to offer Traveling Office Hours every Friday afternoon this spring to give local residents a chance to give us feedback in-person in their own community. Since Traveling Office Hours kicked off on February 22, we’ve been to Genoa, Cortland, Campton Hills, Kingston, Hinckley, Burlington and Maple Park. Constituents who stop by the Traveling Office Hours will be able to meet with a member of my staff, who will collect information to bring back to me for a personal review and follow-up. Looking further ahead, we’ll be in Kaneville on May 3. Stay tuned for details. Do you have a child in grades 7-12 who would like to visit Springfield to serve as an Honorary Page for a Day in the Illinois House of Representatives? My office is currently accepting applications for session dates between now and May 31. Space is limited, so please e-mail my office at keicher@ilhousegop.org ASAP to reserve a date. Please use “Page for a Day” as the subject line of your e-mail. To apply, please provide your child’s name, address, school and grade level. Also let us know what date(s) your child is available to Page. To see the calendar of upcoming session dates, please click HERE. Pages get to be on the House floor during the legislative session, witnessing democracy in action. They can also receive a tour of the State Capitol and meet with me in my Springfield Office. For questions or more information, please call my District Office at (815) 748-3494. I’d like to introduce you to my 2019 Youth Advisory Council! I meet with these students to discuss the legislative process and current issues of importance to local youth. The Council consists of students (juniors or seniors) from high schools within the 70th House District. Members of the Youth Advisory Council are chosen by their school and serve as representatives of the student body. The feedback provided by the Youth Council is a vital aspect of my ability to represent the needs and concerns of young people in DeKalb, Kane and Boone Counties. I believe it is very important for our students to be engaged in current affairs, share their opinions on issues facing the state, and learn about how they can make an impact in public service. We have many of the highest achieving and most talented students in Illinois right here in our district. I want to amplify their voice in Springfield and ensure their input plays a role in policymaking decisions on issues that affect them. The Youth Advisory Council experience lasts into the spring legislative session and culminates this week in a trip to Springfield. Youth Advisory Council members will get to meet with elected officials, legislative staff and lobbyists as well as tour the Abraham Lincoln Presidential Library and Museum and State Capitol.